So, late on a Friday afternoon, I called the number from which the call originated, and a Mom answered. Soon I was talking to a 13-year-old boy named Stan in Iowa. I apologized for RBB’s lack of initial interest and encouraged him to tell me his idea. It was clear from the outset that the caller was inexperienced and while we treated him courteously, we got off the phone quickly. Too quickly for my liking. At first glance it would have been a costly project with little chance of a profitable return on our investment. But I wondered: without actually investigating would we ever truly know? Surprised but heartened, Stan spoke of a simple pen-sized gadget that people could insert into the soil of their houseplants. A small LED would alert the person that their plant’s soil had dried out enough to require watering. Like you, I immediately saw the utility of the concept! Over the past 41 years, RBB has been involved in literally thousands of product development projects. While no two are the same, all successful launches must reach certain milestones before an idea can hit the market. I knew from our conversation that this might take a while and there was no guarantee of success. And when asked how much money he could spend on the effort, Stan said proudly that he had saved sixty dollars, so there was that. But something in Stan cheered me. Maybe it was his idea, his fresh entrepreneurial spirit (how many 8th graders make such a call? ), or his polite Midwestern manner. If I could remotely mentor him a bit, I would enjoy seeing him succeed. Or, through failure, grow. Greatness is fostered in such ways. Plus, the industry can always use another highly motivated project developer. I ended that first conversation with a homework assignment for Stan to email me everything he could envision about the project. It was clear that RBB couldn’t make money supporting this endeavor so it would have to fit around our other work. Still, we wanted to make Stan’s vision a reality. When RBB created our Mission of moving heaven & earth to get our small batch electronics customers what they need when they need it, we did not exactly anticipate this type of situation. But that’s kind of the point; we rarely know ahead of time what those needs are going to be. Each case is different. And now, with so many clients arriving from the internet, we have learned to be even more responsive than before. Seldom are we able to research and plan the approach we’re going to take with a client. The essence of a small batch job shop is to listen fully to the prospect’s needs and get creative in meeting them. Granted, in projects like Stan’s that don’t make financial sense on paper, CEO’s usually make the call. But the “saying yes” gene is pervasive in our DNA. Going out of our way to help a client is an oxymoron… since whatever they need is on our way. While the RBB technical team was busy refining Stan’s concept into a workable prototype, I challenged his thinking about his target market, price, and competitive positioning. These issues are what differentiate a successful launch from merely a good idea. Stan busily set about learning and defining how to proceed. By the time he got his prototype in the mail, he was beginning to think like a business owner – and I thoroughly enjoyed watching his transformation. In lieu of payment we asked Stan to send us a video of his idea in action. If there were any doubts along the way, one glimpse of this bright, articulate young man set them to rest. After killing my own share of houseplants through negligence, I believe Stan’s project has real commercial merit. But no matter the business viability, I know we made the right decision to invest in him. And we hope his future employer will pay it forward! 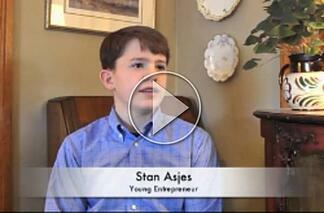 Click here for a video of Stan describing his prototyping experience.